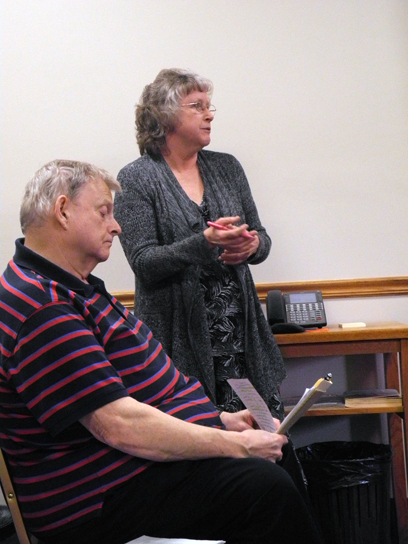 Garrett Neese/Daily Mining Gazette Houghton County Treasurer Kathleen Beattie discusses a former office building the county could consider as office space for some county departments at a County Board meeting Tuesday. HOUGHTON — A commercial building recently foreclosed upon could have use for Houghton County as office space, Treasurer Kathleen Beattie told the County Board Tuesday. Beattie suggested the board walk through the building at 402 W. Sharon Avenue, which was formerly a dentist’s office. By moving some of the more administrative offices out of the courthouse, Beattie said, it could also reduce the chances of run-ins with inmates coming up and down the staircase for court hearings. “One of these days it’s going to be someone with small children going in and out the front door at the same time the sheriff’s deputies are escorting somebody in for their hearing, and maybe there could be an altercation or putting that mother and young child at risk,” she said. The building has gone through county tax foreclosure. The IRS has a lien on the building. If it chooses to take the building by paying the back taxes, it must notify the county by the end of July. Michigan and the city of Houghton would have the next rights of refusal. The buyer would pay $32,500 in back taxes, plus about $8,000 in 2017 taxes. The building is on about a half-acre of property. If the county purchases the building and decides not to move in, it can still sell the building through a realtor. Excess proceeds would return to the county treasury, Beattie said. “Do you think that’s big enough to make into a jail?” Commissioner Scott Ala asked. A jail operation would not be feasible, Beattie said. “The way jails have to be built, we would have to be starting from scratch anyway,” she said.